Platinum Heritage are honoured to be awarded not one, but two TripAdvisor Traveler’s Choice Awards in 2018. Established in 2002, the Travelers’ Choice awards are the highest honour TripAdvisor can bestow. These annual awards are the only travel industry awards based on millions of reviews and opinions from travelers around the world. They reflect “the best of the best” for service, quality, and customer satisfaction. The award is given according to category, from hotels and accommodations to destinations, attractions, brands, and products. 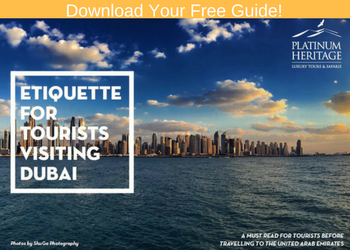 Tours from popular tourist destinations across the Middle East were in the running and three tours in Dubai were ranked in the top 10 experiences – two of these being from Platinum Heritage. Not only did the two Platinum Heritage tours feature in the top 10 experiences, but they were ranked in the top 4 positions. Featured alongside prestigious tours like a Nile River Dinner Cruise in Egypt and a Dead Sea day trip in Israel, it is an incredible accolade for the Platinum Heritage Desert Safari and Camel Desert Safari to be recognised. This means that not only are these tours recognised by other travelers as two of the best in Dubai, but they have proven that they stand out as two of the top tours out of all tours across the Middle East! 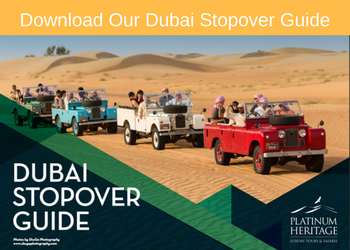 As one of the post popular tours, the Heritage Desert Safari is loved by Guests for it’s authentic portrayal of what Dubai was like 50 years ago. Starting with a wildlife drive in vintage Land Rovers inside the Dubai Desert Conservation Reserve into an immersive evening spent in an authentic Bedouin camp soaking up the rich culture of Dubai, this tour is described by Guests as excellent and a must-do. The knowledgeable guides are considered as both professional and entertaining. The 4-course traditional dinner of delicious Arabic dishes on both tours is renowned as one of the only true representations of Emirati Cuisine on a desert safari in Dubai. The combination of cultural experiences like falconry, camel rides, henna painting, traditional performances, Arabic coffee and bread-making and a magical setting in a Royal desert retreat makes this tour truly unique and unforgettable. As the most traditional mode of transport, the Camel Desert Safari is the most authentic way to explore the desert in Dubai. Traversing the desert sand dunes on the back of a camel through a private Royal desert retreat has been described by Guests as not your average “I rode a camel” experience, which is usually a quick hop on and off a camel for a photo – it is a true adventure and not one to miss! After an incredible falcon show, Guests ride in vintage Land Rovers to an authentic Bedouin camp to spend the evening revelling in cultural demonstrations of Dubai’s rich heritage like Arabic bread and coffee-making, henna painting, yola dancing and Arabic drumming. The 4-course traditional dinner includes a spread of some of the region’s favourites like lamb ouzi and shish tawook. If you are looking for an experience unlike any regular desert safari that hundreds of other providers in Dubai offer, then this one is for you!